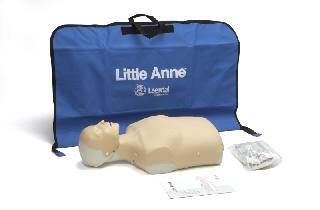 The Little Anne™ CPR training manikin is a realistic, inexpensive, lightweight, adult CPR trainer that offers all the essential features. It is designed with both the user and instructor in mind. The airway can be opened using head tilt/chin lift and/or jaw thrust techniques. Economical, disposable airways, with removable, reusable faces. A "clicker" confirms correct compression depth, and is equipped with a compression spring for consistent resistance.